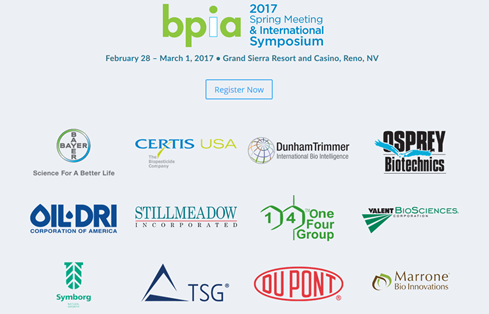 Symborg will be one of the main sponsors of Spring Meeting 2017 organized by BPIA, the United States Biological Product Industry Alliance. This international meeting will be held from February 28 to March 1 in the city of Reno, Nevada and will host various conferences on the current international market for biopesticides. The symposium will be attended by international speakers such as Craig Thomas, Economist & Author and Evans Baiya, Managing Director of Agrimery Fresh Foods. The Biological Product Industry Alliance is a non-profit organization dedicated to fostering increased awareness and adoption of biopesticide technology. BPIA membership includes biological pesticide manufacturers and allied industry, with more than 100 member companies internationally and Symborg is one of them. The BPIA promote the responsible development of safe and effective biological products as beneficial tools for agriculture, horticulture, public health, and consumers through education, outreach, and advocacy activities. Symborg is leader in agricultural biotechnology research development and innovation. The company helps growers to maximize crops yield while overcoming the challenge of sustainability, providing them with innovative biological solutions. Focusing on developing patented technology, Symborg shares its expertise at an international level: today, the company has subsidiaries in Europe, USA, South America, Asia and its products are used in over 40 countries. Symborg contributes daily to the promotion of mycorrhizal research and developments throughout the world as member of the IMS International Mycorrhiza Society. The company is also part of IBMA (International Biocontrol Manufacturers Association) and BPIA (Biological Product Industry Alliance) and participates actively in promoting the concept of biological control methods in sustainable agriculture, in increasing the awareness of biological products, and in bringing improvements to the regulatory process around the world.